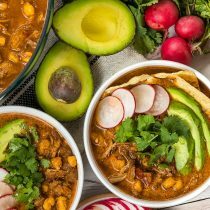 A cozy retro dinner your family will love! 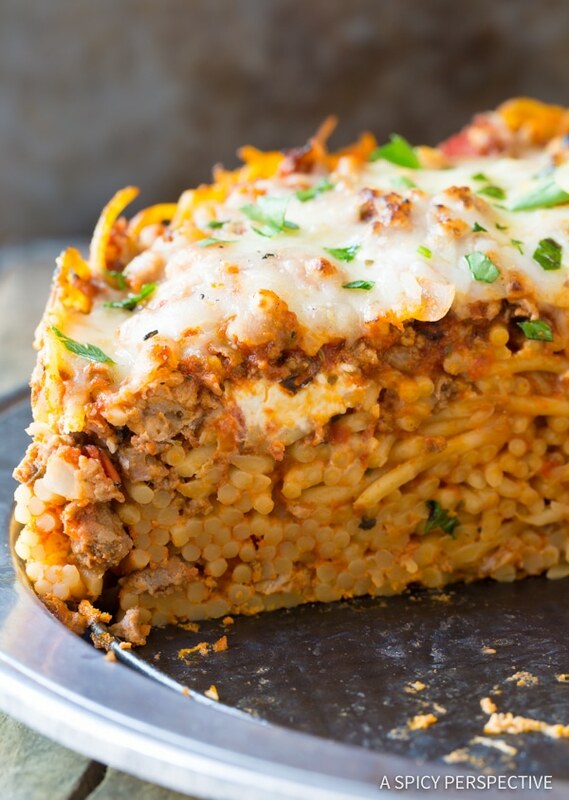 Today’s Baked Spaghetti Pie Recipe is a throwback to potlucks and Sunday suppers. 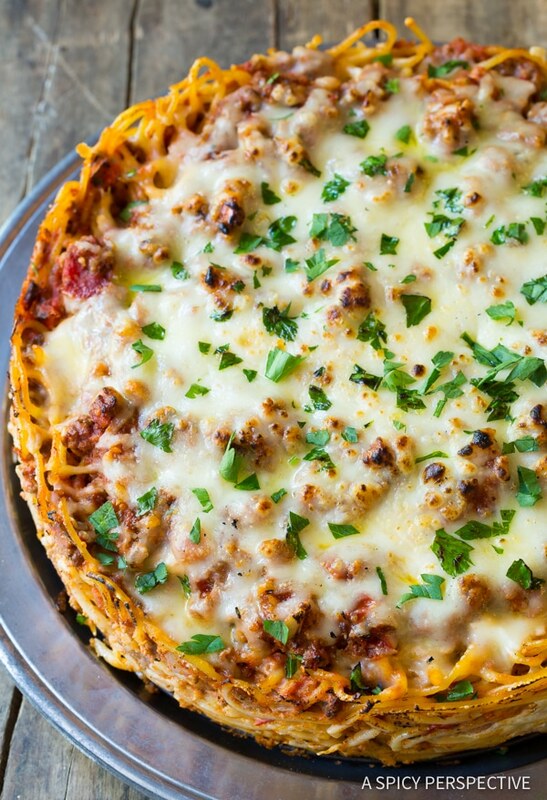 The first time I ever made a Baked Spaghetti Pie was in 1994. I remember the year specifically, because I had just graduated from high school and entered a pre-college internship for a year. My boss had a really sweet family. After work I would occasionally babysit his kids and help his wife Lynn around the house. She was pregnant with their fourth child and was trying to prep a freezer full of meals before she gave birth, to make it easier to feed the family once the baby came. One Saturday I spent the entire day helping her turn freshly-picked apples into gallons of homemade apple sauce, making sausage and potato casseroles in foil pans, and making multiple baked spaghetti pies. 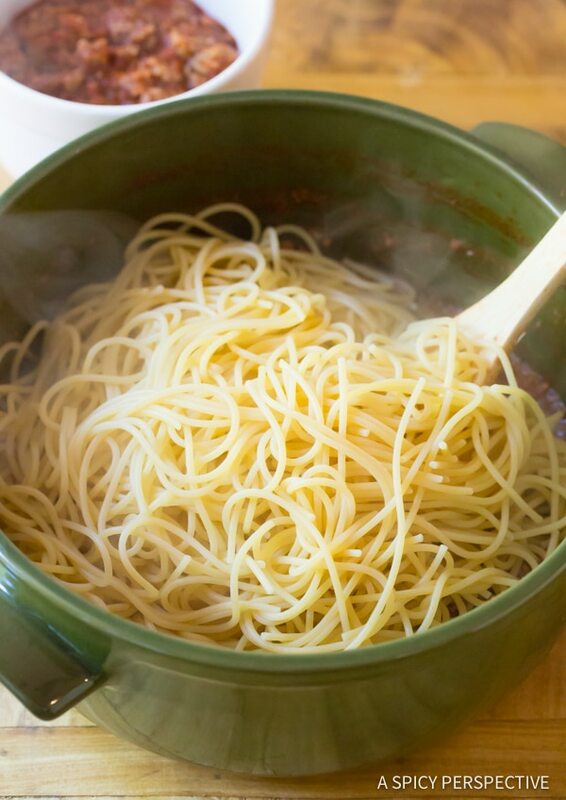 I was enamored by the idea of pressing spaghetti and meat sauce into pie pans, so it could be easily frozen and rewarmed later. 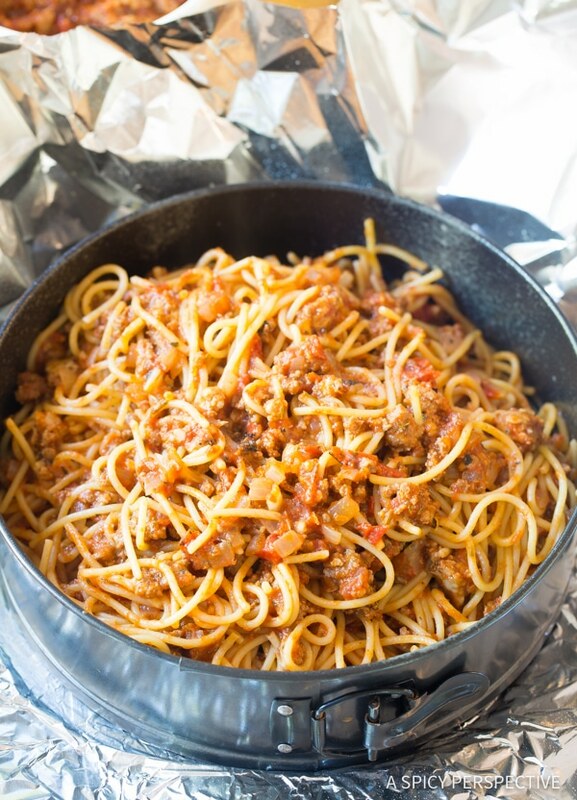 Spaghetti and meat sauce is always a crowd-pleaser. Yet, turning it into a pie offers a fun twist, and it’s pretty darn handy! 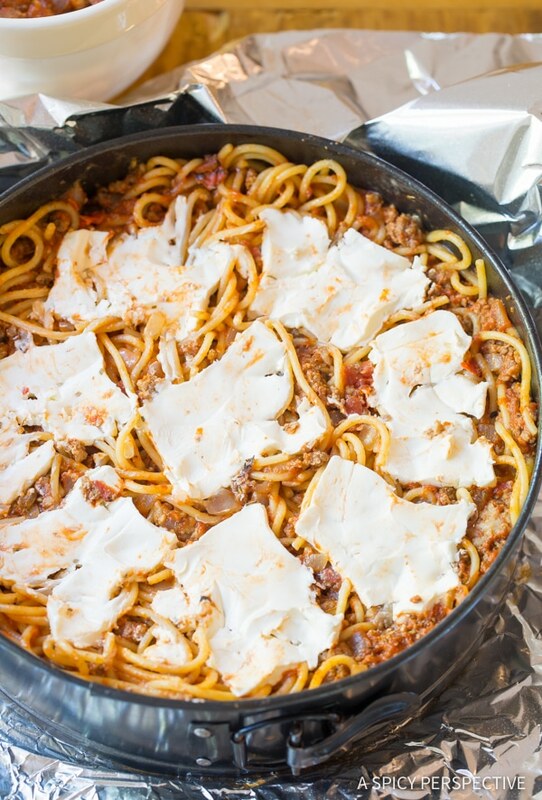 Not only can you freeze and reheat this Baked Spaghetti Pie Recipe. 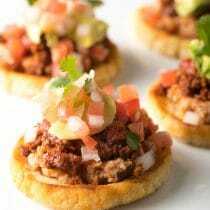 They are also fabulous make-and-take dinners for sick friends, family’s with new babies, and for potlucks. Everyone is excited to get their slice of spaghetti and meat sauce. Yet it seems to create less messy hands and faces than traditional spaghetti. 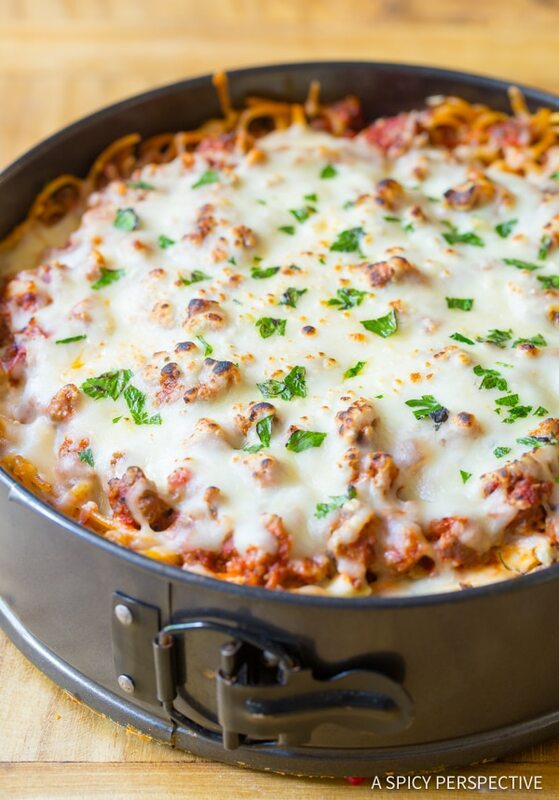 Lynn told me she learned how to make her baked spaghetti pie recipe from her grandma. 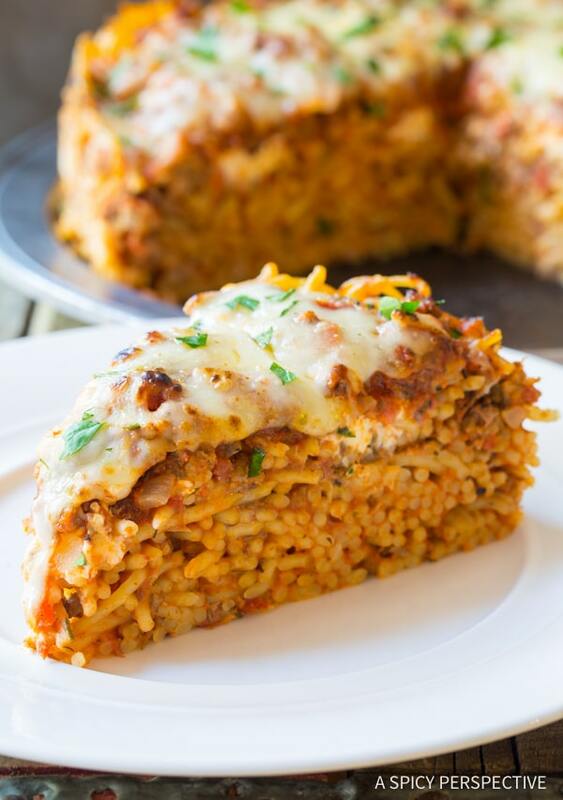 However, I have tweaked this recipe over the years, into a bigger Baked Spaghetti Pie with a surprise inside. 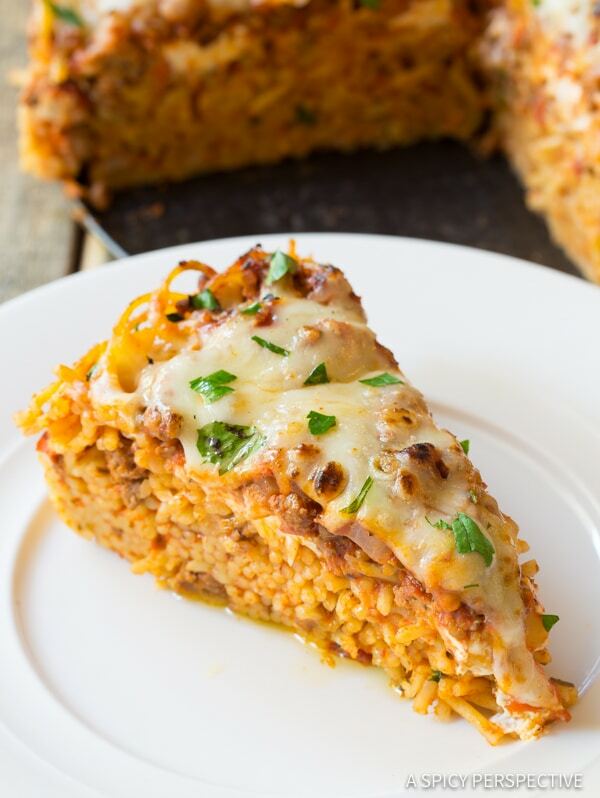 When you cut into my baked spaghetti pie recipe, you’ll find a silky layer of cream cheese! It’s easy to multiply the recipe to make several pies at once. 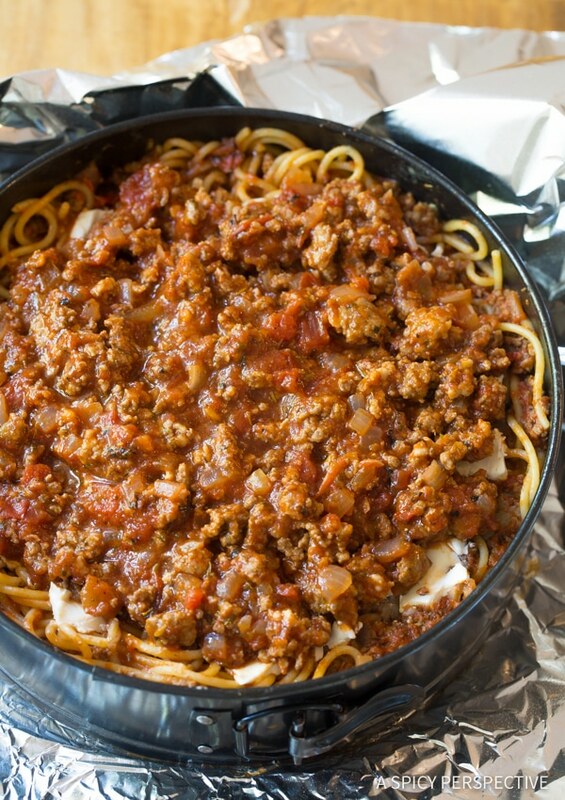 If you plan to make a bounty of spaghetti pies to place in the freezer and give away, I suggest buying round or square 10 inch foil pans. Classic foil pie pans aren’t quite large enough. 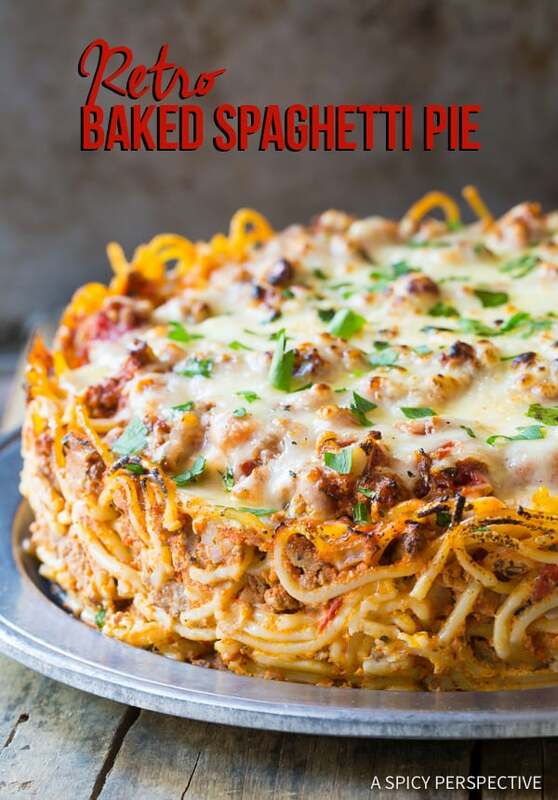 Retro Baked Spaghetti Pie Recipe - A family dinner with the essence of cozy spaghetti and meat sauce, baked into a pie! You can cut and serve whole pieces. 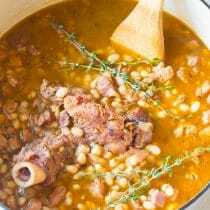 Place a large pot of salted water over high heat to boil. 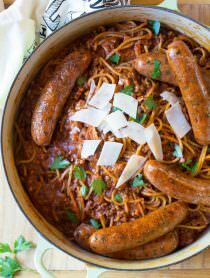 In a separate saucepot, add the ground beef, sausage, onions, and garlic. Brown the meat over medium heat for about 5 minutes, breaking into small pieces with a wooden spoon. 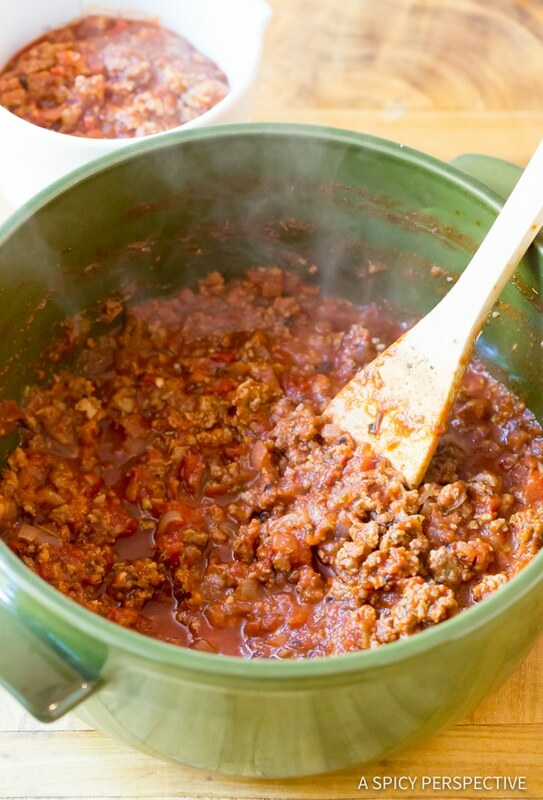 Once the meat is cooked and the onions have softened, add the crushed tomatoes, tomato paste, Italian seasoning, and 1 teaspoon salt. Stir and simmer on low. FREEZER INSTRUCTIONS: If you plan to make and freeze your Baked Spaghetti Pie, make the pie as instructed above, but do not bake. 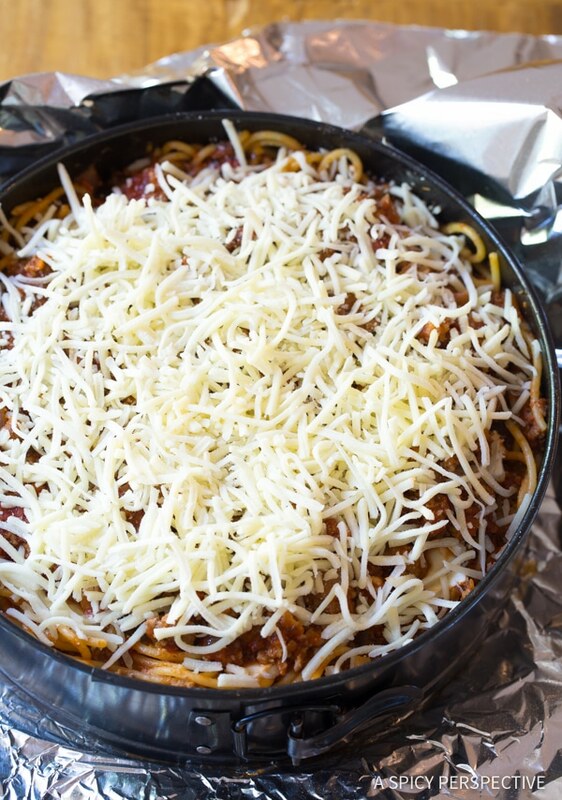 Wrap the pan thoroughly with foil and place in the freezer. When ready to use, heat the oven to 350 degrees F, and baked the frozen pie covered for 50-60 minutes. If making multiple pies, you can make and freeze them in 10 inch round or square foil baking pans. Traditional foil pie pans are not quite big enough. I made this 1 Sunday for our Family Dinner! This was just for my Hubby, his Brother, & myself. 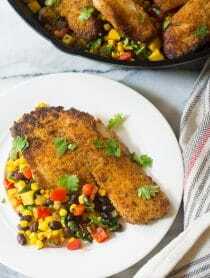 As it turned out it was Delish and most importantly “A Keeper for my Recipe Book to Repeat down the Road Meal”! Thank You SOO much, and Yes it was used for Leftovers for 1 meal for both Hubby & Myself during the week! Lastly, He was so happy, he was able to have it for 2 lunches for work! This was delicious… But please be aware that the 25 minute cook time is from using all hot ingredients. If you cook from cold it will take a lot longer. Internal temp should be about 160 degrees. The recipe calls for cream cheese, but it is not listed in the ingredients. So sorry about that! It’s fixed now. Our recipe format has been glitchy and we are in the process of moving all our recipes to a new system. Thanks for your patience! 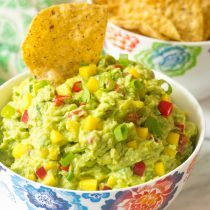 There are no amounts of cream cheese and mozzarella listed on this recipe? Loved it! It was super fun to make…my husband thought it was hilarious. he LOVES pasta so I baked him a cake! 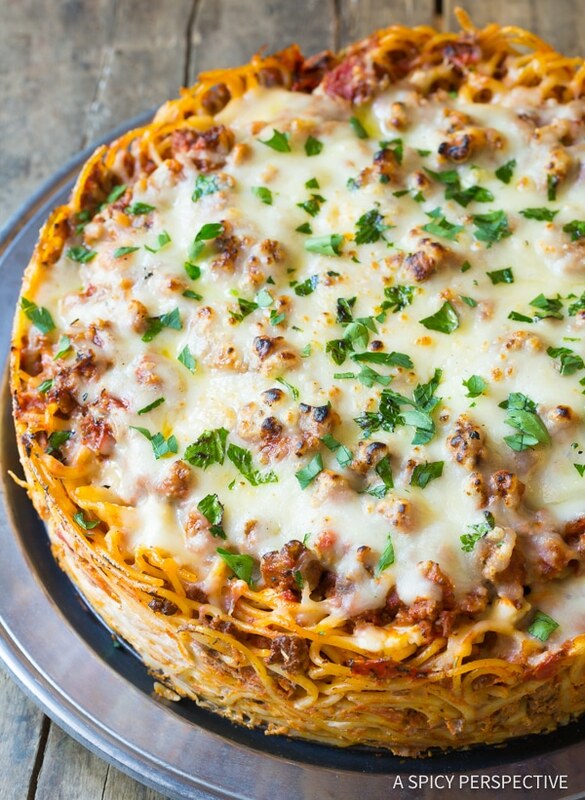 A spaghetti cake! This is a dish my family used to make when I was a kid. We used drinking straw pasta a dozen eggs mozz cheese parm cheese ground beef in layers and leftover eggs on top. excellent with sauce and fried the next day! Can’t find drinking straw pasta anymore. 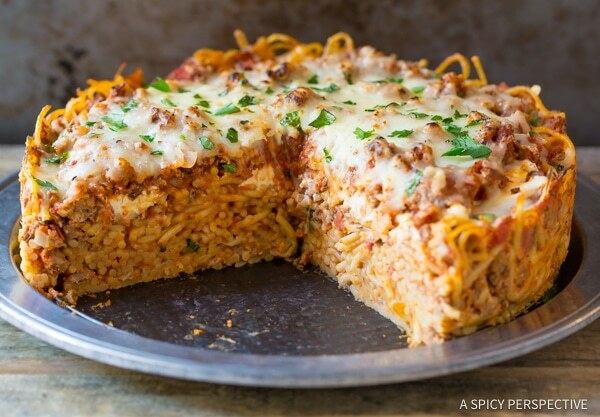 In honor of Pi Day, I made this spaghetti pie last night and stored in fridge to bring to the office to feed several computer geeks for lunch today. I baked it in our office toaster oven and served with garlic bread and salad and everyone absolutely loved it. This is definitely a “keeper” recipe to be made again and again. Looks so yummy! Your pictures are pretty too….& I love the tip about the 10″ foil pans! Will buy these ASAP! I love this!! For us, for sharing. Oh man I cannot wait to try. This will blow my kids mind! 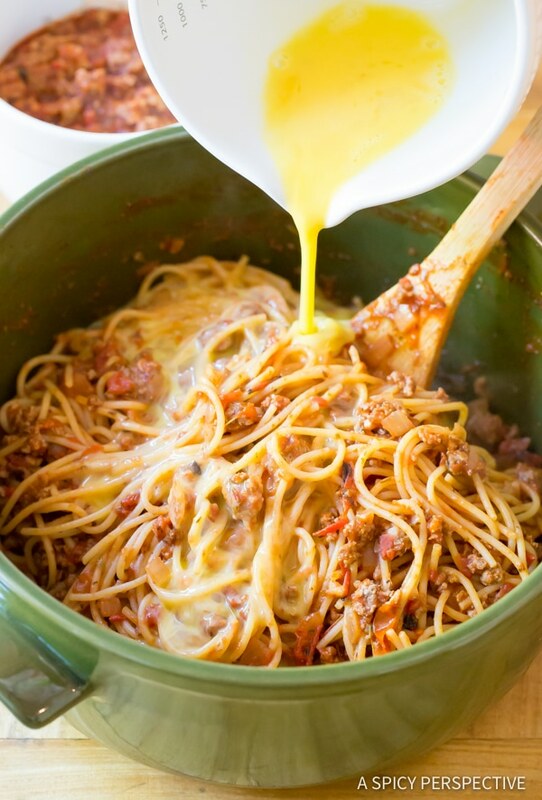 Love this ‘pie’ take on spaghetti! This is so retro, I love it. 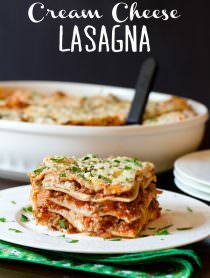 I have heard about this recipe but never eaten it. Now I am most definitely going to try. I might put mozzarella instead of cream cheese. What do you think?